In 33 years as a major-league manager, Tony La Russa was fired once. The White Sox replaced him with Jim Fregosi. Fregosi managed the Cardinals’ Class AAA club at Louisville from 1983 until he replaced La Russa as White Sox manager in June 1986. Among the prospects managed by Fregosi at Louisville were Vince Coleman, Danny Cox, Ken Dayley, Ricky Horton, Tito Landrum, Greg Mathews, Jose Oquendo, Terry Pendleton, Andy Van Slyke and Todd Worrell. Seventeen of the players on the 1985 National League championship Cardinals club played for Fregosi at Louisville. An all-star shortstop for the Angels in the 1960s, Fregosi managed the Angels from 1978-81, leading them to their first division title in 1979, before he was fired and replaced by Gene Mauch. After sitting out the 1982 season while running a food brokerage business, Fregosi became Louisville manager in 1983. Lee Thomas, the Cardinals’ director of player development, had been an Angels teammate of Fregosi and was instrumental in bringing him into the St. Louis organization. 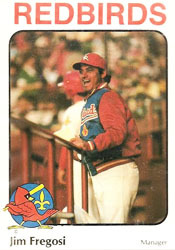 Louisville won back-to-back American Association championships (1984-85) under Fregosi, but with Whitey Herzog entrenched as Cardinals manager Fregosi’s best hope of managing again in the major leagues was with another organization. The Mariners contacted him, but Fregosi wanted an opportunity with a franchise prepared to win. In June 1986, White Sox general manager Ken “Hawk” Harrelson fired La Russa and pitching coach Dave Duncan. The White Sox were 26-38 and Harrelson had been clashing with La Russa and Duncan. “The record is not indicative of the talent involved,” Harrelson told the Chicago Sun-Times. Fregosi was Harrelson’s first choice. Harrelson had sent scouts to Louisville and their reports on Fregosi were glowing, the Sun-Times reported. La Russa went to the Athletics and won three American League pennants and a World Series title before joining the Cardinals and completing a managerial career that earned him election to the National Baseball Hall of Fame. La Russa won two World Series titles and three National League pennants with the Cardinals. Fregosi managed the White Sox from 1986-88 before stints as manager of the Phillies (1991-96) and Blue Jays (1999-2000). He won a National League pennant with the 1993 Phillies.